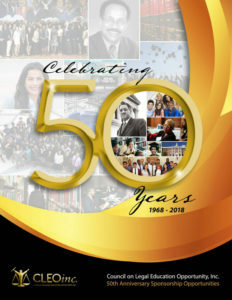 The Council on Legal Education Opportunity, Inc. (CLEO) would like to sincerely thank all of our 50th Anniversary donors and sponsors for their contributions in recognition of CLEO’s historic anniversary milestone! Their generosity will help enable current and future generations of aspiring legal scholars to attend CLEO programs all over the country and subsequently bring greater diversity to the legal profession. If you are interested in learning more about contributing or becoming a sponsor of CLEO’s 50th Anniversary, please click here. If you already made a contribution and would like to share a brief testimonial about why you or your organization decided to support CLEO’s 50th Anniversary, please contact us here.